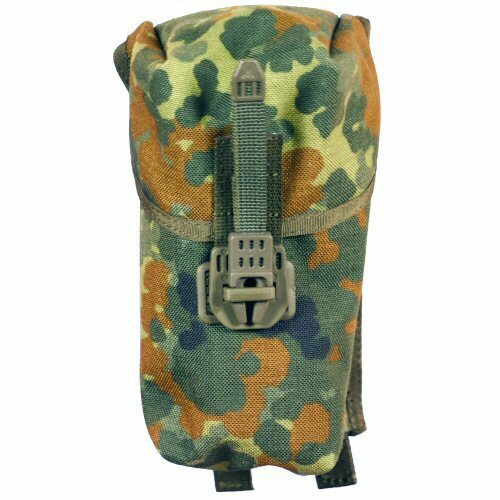 Pouch for one smoke grenade for the German IdZ vest. The pouch is large enough to fit two G36 magazines inside, or one 4-minute smoke canister. The pouch is constructed from texturised, internally coated Cordura. 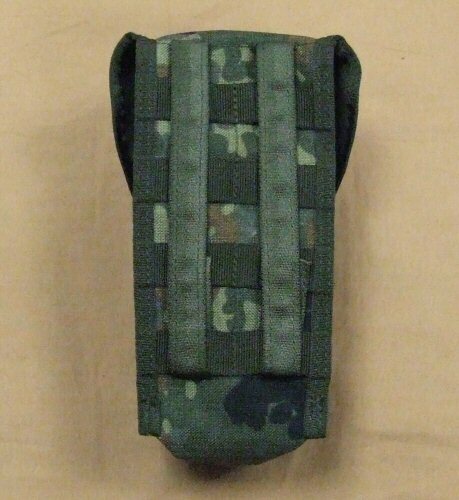 The pouch is attached to the vest using an adaptation similar to the US MOLLE attachment system, with thinner 1cm wide strapping and a semi-rigid tab system to hold the strapping in place. The rear of the pouch is fitted wth 1cm wide cross strapping to enable the main (vertical) strapping to be interwoven onto the vest for better pouch retention. The front of the pouch has an enhanced Spanish type closing system requiring the operator to clip the two fins together before retracting. This helps to prevent content loss even during crawling. View of rear of pouch showing the 1cm wide MOLLE strapping.